Long before the Kindle had a firm grasp on the eBook market, and even before the term eReader had much meaning in the minds of the public, Sony had started up their line of Sony Readers. They were the first company that not only did the job, but did it well. In time, unfortunately, they seemed to fall behind. Too many other consumer choices and an ongoing failure to present competitive prices have led to the whole product line struggling to expand its business. Recent information reveals, however, that Sony is definitely not at the point of giving up just yet. A Bloomberg report provided indications that Sony will be upgrading its current line with both hardware and software improvements, probably before the end of August. There are no indications at this time to indicate that price drops will be accompanying the upgrades, but it can be assumed that if there are any, they will be small. The upcoming release of the new Sony S1 and S2 Tablet PCs will be intended to target “a more status-minded customer”, according to a recent CNN report, and it is likely that they will similarly weigh the prestige of owning a Sony Reader as a more important factor than matching the price of the increasingly inexpensive Amazon Kindle. Both eReader and Tablet ownership continue to rise and are expected to continue doing so through the immediate future, but it remains to be seem whether or not Sony can grab a piece of this momentum. There will likely be two major factors contributing to their success or failure. The biggest thing that they have working against them, aside from unit price, is their eBook store. Unlike the Kindle and Nook, each of which is coupled with a truly impressive selection of titles available for purchase, the Sony Reader Store has not developed an impressive following. The selection has gotten better over the years and, thanks to the Agency Model of eBook pricing, nobody has a significant advantage over them when it comes to prices. Nothing has made their store particularly unique, however, and without some sort of reason for it to stand out, the Reader Store is just another random eBook store among many in the eyes of the potential customer. On the other hand, the hardware will likely be a major advantage. Say what you will about the Reader line, Sony has proven willing to experiment and innovate. They not only essentially started the eReader business as we know it, they made many of the mistakes and some of the successes that have made eReaders into what we know and love today. 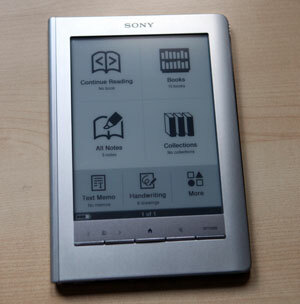 The first touchscreen eReader was a Sony, I believe, even if they didn’t pull it off quite right. Their early PRS-505 model was impressive enough that a reasonably cheap copy of it with a more modern display would immediately be a step up from many of the recent options we’ve seen, even years after it became officially obsolete. It will be interesting to see if there are any really significant updates in the latest batch. The Kindle Competition has been great lately and it’s nice to see some truly superior options make their way to the top. I’ve always loved my Sony Readers. A comeback at this point is more than welcome. This entry was posted in E-Book Readers, Kindle Competition and tagged august, Competition, kindle vs sony reader, Sony, Sony Reader, tablet by matthew. Bookmark the permalink.